I think my php.ini is fine. Then I go to my webpage and use bookmarklets which append ?XDEBUG_SESSION='PHPSTORM' and nothing happens I tried also using xdebug.remote_connect_back = 1 to just use the connecting ip instead of the tunnel and still nothing. Anyone know how I can debug this any better? xdebug.remote_connect_back should definitely be off / 0 (zero). 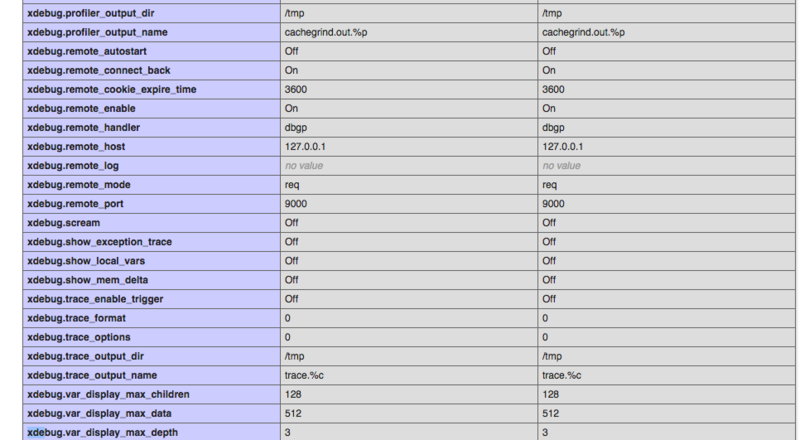 Please collect xdebug logs: http://xdebug.org/docs/all_settings#remote_log for such debugging attempt. It's possible that local firewall still blocks you from accepting incoming debug connection .. or port is occupied by another app. Similar recent question at StackOverflow: http://stackoverflow.com/a/33401627/783119 -- you can try connecting to PhpStorm using telnet to see if tunnel is working/PhpStorm is listening. Thanks Andriy will change xdebug.remote_connect_back to 0, reload the php.ini and get you those logs. So I set xdebug.remote_log = "/tmp/xdebuglogs.log" in php.ini then restart php. Tried going to webpage and launching debugging via applet but nothing gets written to the log. Is there anything else I need to turn on in php.ini get logs working? When I manullay drop ?XDEBUG_SESSION_START=PHPSTORM it writes to the error log but debugging doesn't work. It doesn't bring up the phpstorm program like it should. I have breakpoints set. But nothing seems to happens. Like you, I think from that log it should work but it doesn't. 9000 is the default port right? Where can I set or check this setting in PHPSTORM? Should this be set to 9000? Since I use ssh -R 9000:localhost:9000 user@remoteip port 9000 is taken, how should I set this up properly? 1) Which "error log"? I assume you are talking about xdebug log (which is ordinary log). 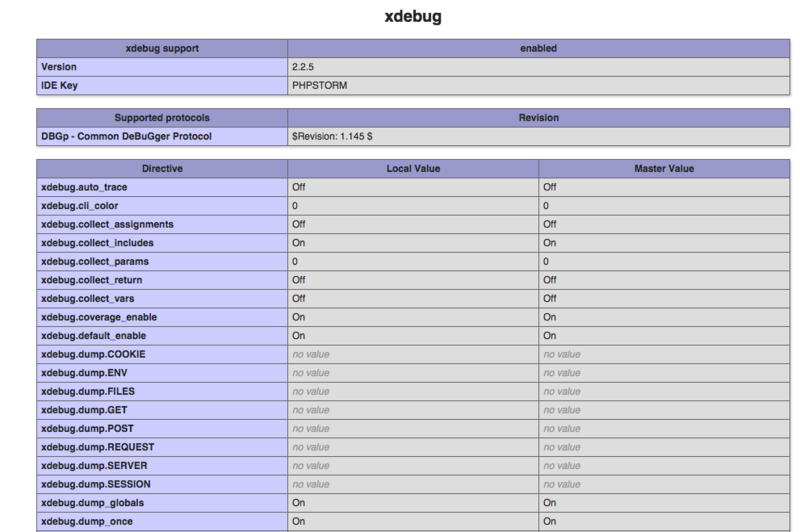 2) If you drop ?XDEBUG_SESSION_START=PHPSTORM then what other options you have set or used for xdebug to try to debug? 9000 is the default port right? Where can I set or check this setting in PHPSTORM? Settings/Preferences screen has quick search box (top left corner) -- you can use it to narrow your search. Should be in "PHP | Debug"
If you exit PhpStorm but still have SSH tunnel working -- will xdebug log have the same info or different? If you launch PhpStorm but not activate any debug session (or "phone handle" icon) -- will log contain the same info (connection successful)? Yes -- that extremely likely would be the reason. 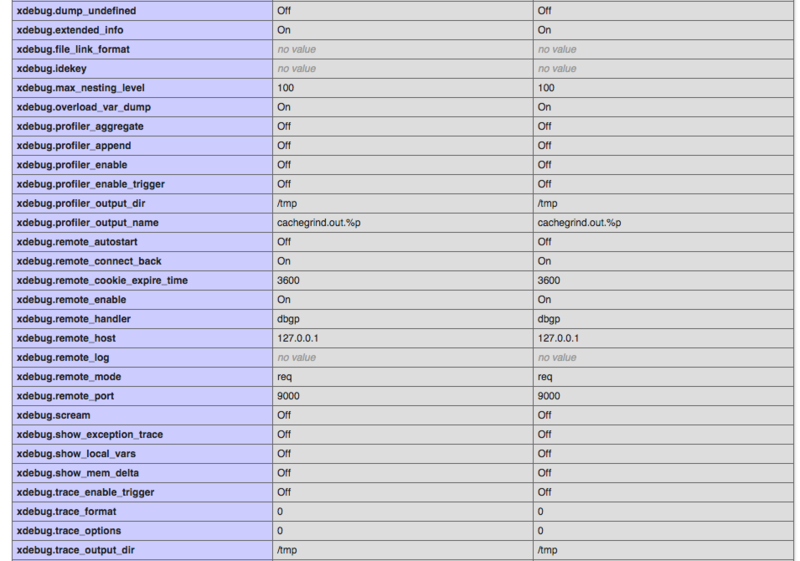 You should not change built-in web server port -- especially to xdebug's 9000. Better leave it at default 63342. But xdebug's one you can change -- I just see no reason for that -- it should match port used in SSH tunnel so leave xdebug at 9000. That port has priority over xdebug (simply because IDE binds it when it starts while xdebug port only when needed). Plus, on Mac, for some reason, IDE does not report that xdebug port is already occupied. Yes that's right just the ordinary error log. Ya I figured as much and already changed as you requested. Even with PhpStorm closed? That's odd. Can you check with netstat (or lsof -- something like "sudo lsof -nP -iTCP -sTCP:LISTEN") what app has that port opened? Also -- have you tried connecting from remote to local via telnet? What kind of response did you got? Also, do you have PHP/xdebug installed locally? Can you test that you can debug simple local CLI scripts (require no server). Maybe it's local firewall? As you can see the person in SO question was more lucky / had better setup? for basically anything I do. The reason it was showing it 3 times was because it was debugging a php file that is receiving an ajax call. When I switched to a file just containing <?php phpinfo() ?> it shows only one iteration in the debug log. Overall it looks OK (your steps). Ya tried both and they don't even register an entry in the log. I will try this to find out. So maybe something on my server is using port 9000? But would I be able to make a ssh tunnel is that was the case? No I don't but guess I can. I don't have any firewalls up but once again if I did I shouldn't be able to create the ssh tunnel I am using right? Read once but can read again to see if there is anything helpful. Where did you run it (cannot say it myself based on info)? It meant to be on your local Mac. The idea is to see who has TCP 9000 port open. Since I'm not Mac/Linux user .. I'm not familiar with all those columns (what is which) so cannot tell this for sure. But I suggest to kill all those processes that have TCP 9000 port opened and try again (activate "phone handle" icon) -- the owner of such binding shoul dbe phpstorm app. Righ now it looks like it's a web server. So I switched 9000 to 9001 in my ssh tunnel and ini php.ini file. My php5 is using port 9000 to listen so it can't be used to debug. 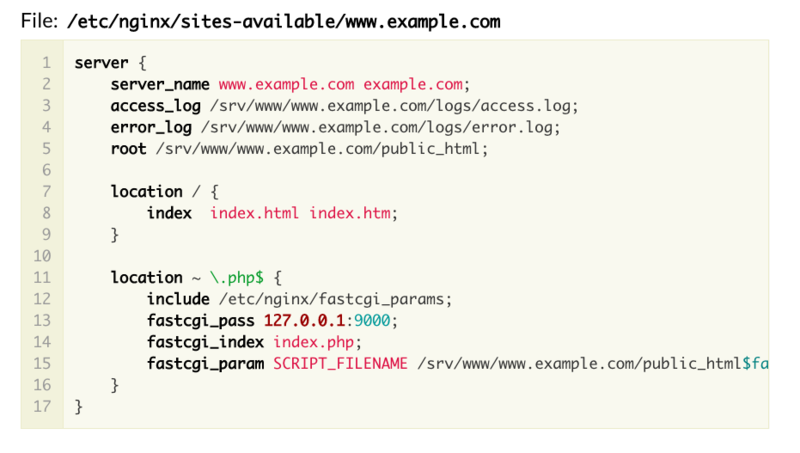 Since this is nginx not apapche the php5-cgi I guess talkes to nginx on port 9000? Anyway I really appreciate all your help. Since this is nginx not apapche the php5-cgi I guess talkes to nginx on port 9000? It could be... but it's very unusual choice to use standard xdebug port for such communications. But fastcgi does indeed listen by default on localhost port 9000. As a side not do you have any idea why the phpstorm bookmarklets may not work for me? I have to manually drop in ?XDEBUG_START_SESSION=PHPSTORM every time I want to debug. And thanks so much your help couldn't have done it without you! They seem to work OK (tested few days ago in Chrome & IE).